Similar to the South Fork of the American River Bridge carrying SR-49 west of Coloma, the South Fork of the American River Bridge carrying SR-193 is a little east of Coloma. However, this bridge was built in 1994 (instead of 1951), it's only two spans long, it has a fancy flared pier wall, barriers with recessed openings to simulate a balustrade railing, and it's a prestressed concrete cast-in-place box girder bridge. Perhaps at this point we should look at a map to see where all the bridges we recently visited are located. At the left end of the Google topo map shown below is the SR-49 Bridge across the South Fork. After a big loop the South Fork travels between Marshall Gold Discovery State Park and Mount Murphy where the Coloma (Mount Murphy Road) Bridge is located. Then we travel upstream to the middle of the map to find the SR-193 (Chili Bar) Bridge across the South Fork (today's bridge). 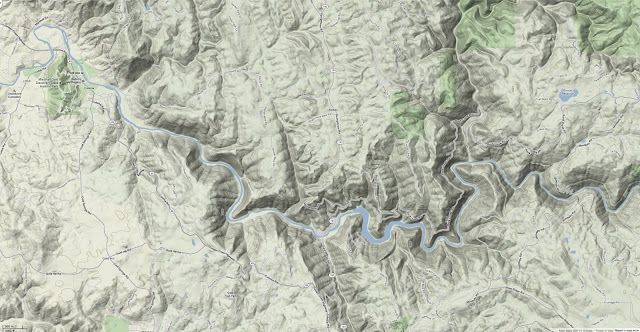 In the next few days we'll visit the Rocky Creek Bridge (a little north of the South Fork) and then the beautiful Mosquito Road Bridge across the South Fork (on the right side of the map). El Dorado County, California Bridges: Chili Bar (SR-193) Bridge across the South Fork of the American River by Mark Yashinsky is licensed under a Creative Commons Attribution-NonCommercial-ShareAlike 3.0 United States License.